How do you make rainwater potable? The answer is simple. Don't use the roof in the first place, Instead, collect rain straight from the sky. But don't take our word for it. Read this study from the Texas Water Development Board. 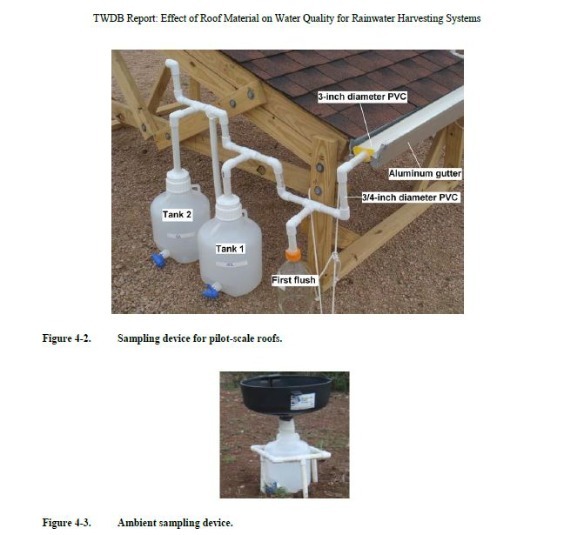 It explains in no uncertain terms that roof run-off, even after going through a first flush (which many folks do not use anyway), contains contaminants at levels above USEPA drinking water standards (see page 35). But perhaps the most interesting part of this study is the control samples (to collect ambient rain as they called it) were made using a 18" funnel made of polyethylene (see picture)- the same material we use. In other words, these researchers knew that the only way to catch pure rain (to compare to roof run off) is to catch it on clean plastic. So how did the "pure rain" do in their study? Drastically lower values for all contaminants and well in line with EPA standards.